, an eminent scholar, philosopher, and naturalist, and called the Pliny of Germany, was the son of Vasa Gesner, and Barbara Friccius, and born at Zurich in Switzerland in 1516, where he received the first rudiments of the Latin and Greek languages. 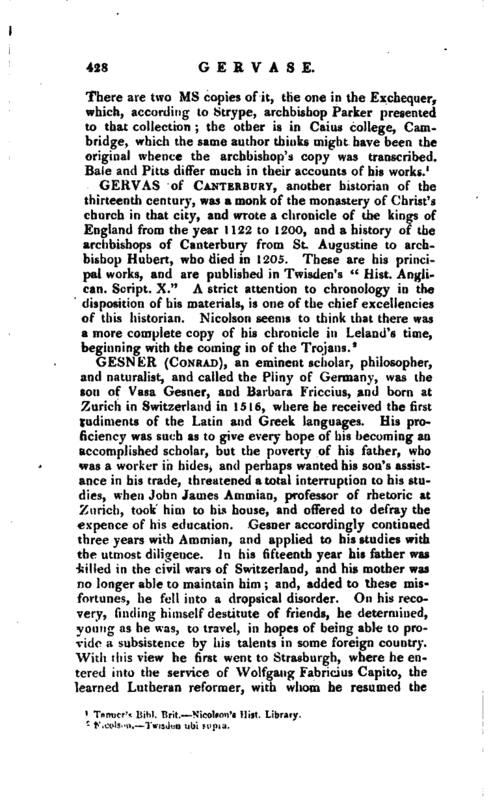 His proficiency was such as to give every hope of his becoming an accomplished scholar, but the poverty of his father, who was a worker in hides, and perhaps wanted his son’s assistance in his trade, threatened a total interruption to his studies, when John James Ammian, professor of rhetoric at Zurich, took him to his house, and offered to defray the expence of his education. 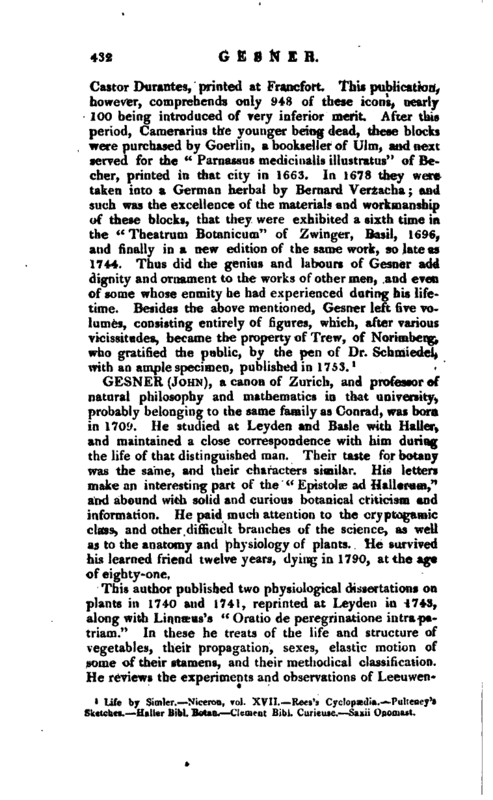 Gesner accordingly continued three years with Ammian, and applied to his studies with the utmost diligence. In his fifteenth year his father was killed in the civil wars of Switzerland, and his mother was no longer able to maintain him; and, added to these misfortunes, he fell into a dropsical disorder. On his recovery, finding himself destitute of friends, he determined, young as he was, to travel, in hopes of being able to provide a subsistence by his talents in some foreign country. With this view he first went to Strasburgh, where he entered into the service of Wolfgang Fabricius Capito, the learned Lutheran reformer, with whom he resumed the | study of the Hebrew language, of which he had acquired some knowledge when at Zurich. After some months’ stay here he returned to Switzerland, and the public tranquillity being restored, he procured a pension from the academy of Zurich, which enabled him to make the tour of France. He passed a year at Bourges, applying to Greek and Latin with great attention; and finding his pension too scanty to maintain him, improved his finances in some degree by teaching school. 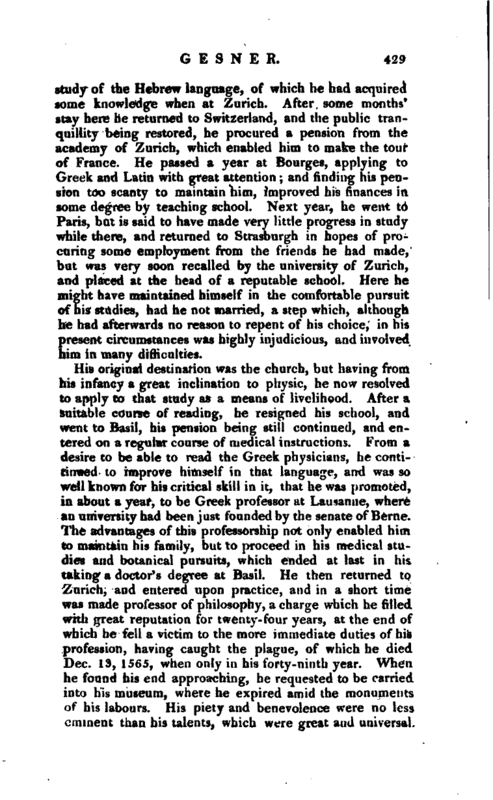 Next year, he went to Paris, but is said to have made very little progress in study while there, and returned to Strasburgh in hopes of procuring some employment from the friends he had made, but was very soon recalled by the university of Zurich, and placed at the head of a reputable school. Here he might have maintained himself in the comfortable pursuit of his studies, had he not married, a step which, although he had afterwards no reason to repent of his choice, in his present circumstances was highly injudicious, and involved him in many difficulties. .“The | botanical remarks relative to the scientific arrangement of plants, on which the supereminent merits of this great man are founded, are chiefly to be gathered from his letters, which were published after his death. From the number of wooden cuts, and of drawings, which he had prepared) it is probable he meditated a general” History of Plants," the future arrangement of which frequently occupied his thoughts, and prompted many of these letters. Gesner’s wife survived him, and notwithstanding the dangerous nature of his disease, which was accompanied with a pestilential carbuncle, she did not desert his death-bed, for he expired in her arms. He left no offspring, but at his death there remained alive of Andrew Gesner, his father’s brother, one hundred and thirty-five descendants, in children, grand-children, and great grand- children. From the latter are descended the modern family of Gesners, some of whom we are about to notice. His remains were honourably interred the day after his decease, in the cloister of the great church at Zurich, near those of his intimate friend, Frysjus, who died the preceding year. 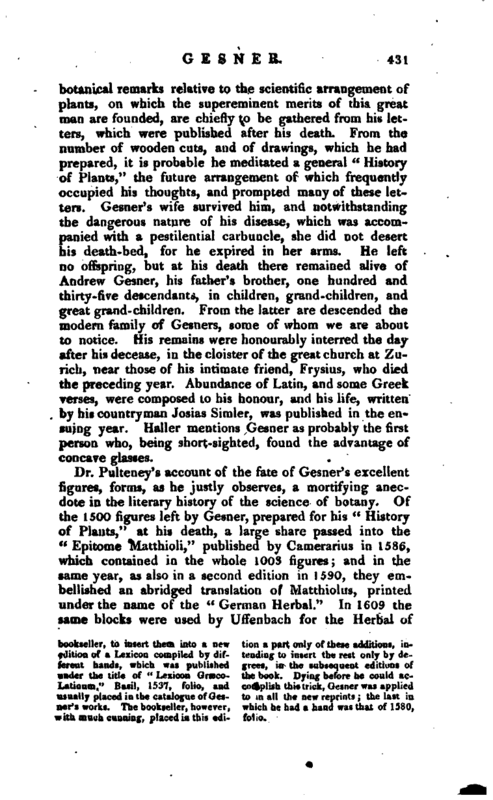 Abundance of Latin, and some Greek verses, were composed to his honour, and his life, written by his countryman Josias Sirnler, was published in the ensuing year. 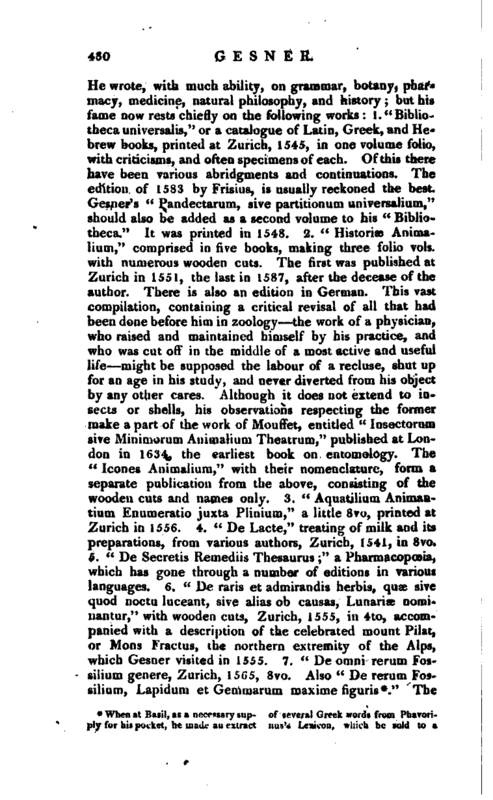 Haller mentions Gesner as probably the first person who, being short-sighted, found the advantage of concave glasses. Life by Simler.—Niceron, vol. XVII.—Rees’s Cyclopædia.—Pulteney’s Sketches.—Haller Bibl. Botan.—Clement Bibl. Curieuse.—Saxii Onomast.